For the second instalment of 'baking with lard' I was keen to try a new savoury pastry, and the search was called off when I came across this Simon Hopkinson recipe for steak and 'tater pie. I have only vague memories of the food from my younger years but one thing I do recall is that dad's mum used to make the most amazing steak and kidney pie. Of course, as a young child it was steak and 'the creamiest mushrooms I'd ever eaten', but as I grew to understand more about the food I was eating I also discovered I love offal so this surreptitious mislabelling of ingredients was in actual fact unnecessary. With a day off finally giving me the opportunity to cook something proper for dinner I decided to make the most of what has undoubtedly become pie weather by baking exactly that. Naturally, some poor planning got itself in the way of a good story and so rather than the full renal compliment it was indeed mushrooms proper that happened to compliment the steak and potato this time around. Recipe deviations aside, the lard pastry exterior was beautiful and crisp, and while I made the mistake of rolling it too thin—thus compromising the structural integrity—the flavour certainly complimented the filling. If you're a lover of bold foods I suspect you'll find this pie rather bland, but if you appreciate a Cornish pasty then this is definitely your thing. Because of the simple ingredients seasoning is really important (so don't skimp on the salt or white pepper), and be sure to use good quality meat with a little fat to help bind everything together. Mr Hopkinson suggests serving his with some pickled red cabbage or piccalilli, and while I only had steamed greens to hand I suspect the sharp contrast here would be the perfect compliment to this simply-flavoured pie. A big glass of red and an open fire wouldn't go astray either. 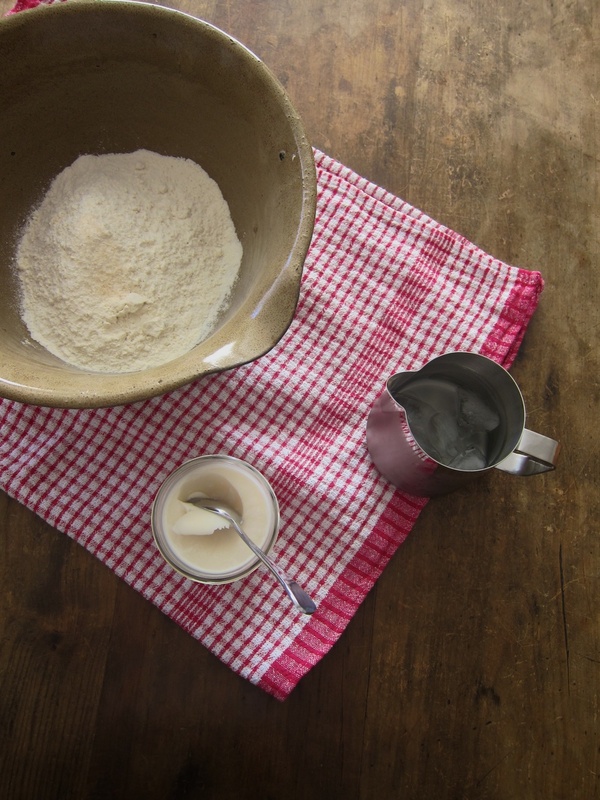 To make the pastry, rub together the lard, flour and salt until it resembles coarse breadcrumbs. Mix in the water and quickly work together, kneading lightly until you have a soft dough. Put into a plastic bag and leave to rest in the refrigerator until the filling has been prepared. Put all the ingredients for the filling—except the water—into a large bowl and mix together well using your hands. 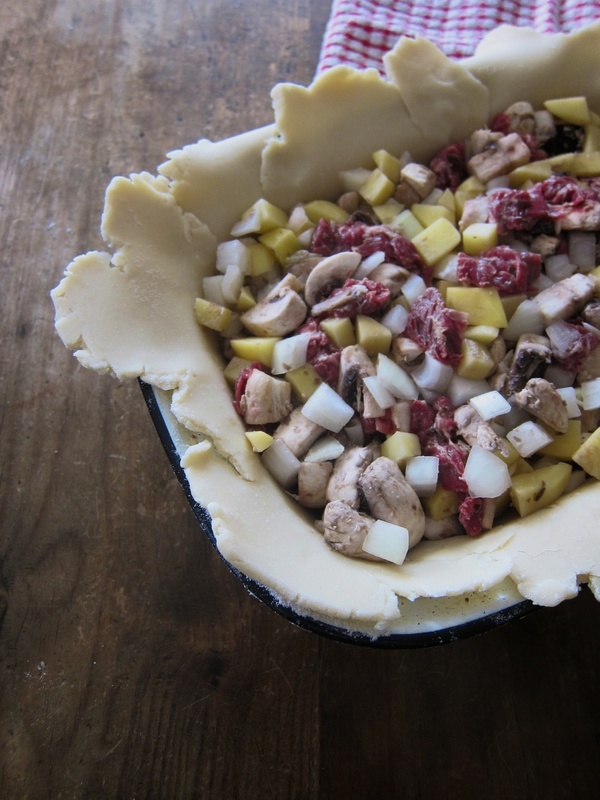 Divide the pastry into two-thirds- and one-third-sized pieces. Roll the larger piece into a circle approximately 3-mm thick and use to line a lightly-greased pastry tin (20-cm in diameter, 4-cm deep), leaving the overhang intact. Roll out the second piece of pastry for the lid and set aside. Pile the filling into the pastry case and carefully pour in the water, which should only just reach the surface. Brush the edge of the overhanging pastry with milk and put on the lid. Press the edges together and trim off the excess pastry. Brush the surface with milk and press the edges together with the tines of a fork. Make two incisions in the centre of the pie and place on a tray in an oven preheated to 200°C. Bake for 25 minutes before dropping the temperature to 150°C. Continue baking for a further 60 minutes, checking from time to time that the pastry is not browning too much (cover loosely with foil if it is). Remove from the oven and rest for 10 minutes before cutting into wedges. ** For the best results make sure not to roll the pastry too thin, and pre-heat the tray in the oven so that the base of the pie will cook through evenly. If you skip the ten minutes of rest before eating the filling will still be quite runny, so do hold out if you can.